We offer a range of quality water treatment products to suit your needs. The Fusion XT Water Softeners are our newest system in the ExStream line of equipment. This system is designed for both high and low flow water demands. All systems have been certified to NSF 44 standards and meets the requirements for all plumbing codes. No more flushing the toilet and getting scalded in the shower because of water softener restriction. This system is a true full-flow system designed for 1� to 3 inch water lines with a full flow interior distribution system, and is available in multiple sizes. Consult the plumbing code charts for proper sizing for your application ensuring that your system meets the demand required by your home. All systems over 1.25� should be factory engineered to the specific application. The Pro eXstream water softener is our most popular system. All Pro eXstrean systems are certified under the NSF 44 certification. They also carry our famous Limited Lifetime Warranty. This system is designed for high flow water demands as required by all plumbing codes. No more flushing the toilet and getting scalded in the shower because of water softener restriction. This system is a true full-flow system with a 1.33" interior distribution system. and is available in several sizes. Consult the plumbing code charts for proper sizing for your application ensuring that your system meets the demand required by your home. 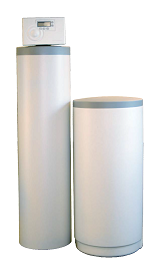 The KDC Filtration System was developed to be used in conjunction with a Water Softener or as an alternative stand alone Whole House Filtration System. The KDC uses a four-stage filtration process to remove and reduce a large number of contaminants and Heavy Metals. It is also a De-Scaler and Anti-Bacterial Filter assuring clean filtered water throughout your house. The Water Maker Five is a compact five stage reverse osmosis system. With its green design, it produces great-tasting water while reducing the amount of water down the drain by 25%. Its small size makes it easier to install in cramped kitchen cabinetry. The NuGen 5 Stage RO system produces great water at a great price. It fits neatly under the kitchen sink to bring your family great water. The Iron eXstream is the best, chemical free, trouble free, low maintenance iron filtration system you will ever own. Whole house reduction of chlorine and choramines from city water supplies. Makes a great pre-filter for a water softener.